A mandala, in the context of Buddhist ritual worship, is a symmetrically ordered geometric diagram used to assist in meditation and ritual. It is intended to symbolise a cosmos or perfect environment into which the mandala practitioner is able to enter by virtue of his practice. In this example, the inner-most circle is occupied by the Buddhist deity Avalokiteshvara, the bodhisattva of compassion. Avalokiteshvara is shown with eleven heads and six arms, standing on a lotus surrounded by a luminous halo. He holds a lotus, waterpot and bow and arrow amongst his attributes. This circle of Avalokiteshvara forms the centre of an eight-petalled lotus. Located at the cardinal points of this lotus are four 'tathagatas' or transcendental buddhas: Vairochana, Amoghasiddhi, Akshobhya and Ratnasambhava. The 'tathagatas' represent families of buddhas with related aspects and directional locations. They demonstrate to the mandala practitioner how human and bodily skills ('skandas') can be transformed. 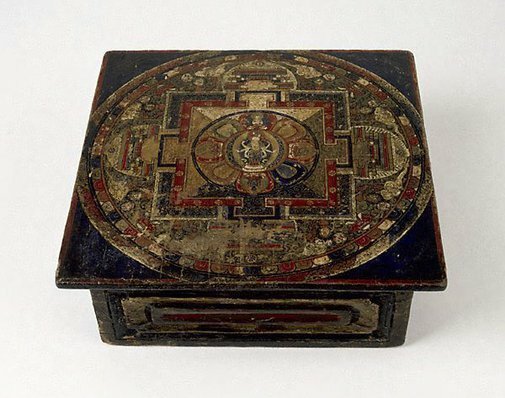 This mandala represents the bodhisattva Avalokiteshvara not only 'in' the cosmos but as the cosmos. It reminds the viewer or practitioner of the immanence of compassion in the universe, but also of this potential in the worshipper. Such mandalas therefore assist in the progress towards enlightenment: that is, in the spiritual reintegration of the practitioner with the cosmos. Asian Art Department, AGNSW, 2000.